KARNATAKA: The only party which is effervescent about the upcoming assembly election in the state is probably the BJP. And it is not leaving any room for the opposition parties Congress and JDS to go one up against it. Understanding the dynamics of coalition where numbers become a vital issue in forming a government, the BJP is not taking things easy and are in a bid to woo a sizeable Tamil population in Bangalore city and Kollar district by attempting to forge an alliance with J Jayalalithaa’s AIADMK in the ensuing elections. BJP sources told that the party was making sincere efforts to set aside some seats to AIADMK in areas where there was a sizeable Tamil population. However, the exact framework of a possible poll tie up is not clear. Sources said while the Tamil vote won't be a deciding factor, it could help BJP in southern districts of Karnataka. For sometime now, the BJP and AIADMK have been coming close on issues like controversial Sethusamudram project. 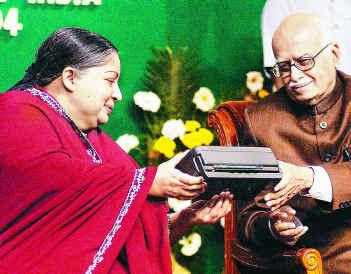 In January, 2008 Gujarat chief minister Narendra Modi had met Jayalalithaa in Chennai and the meeting sparked rumours of a BJP-AIADMK alliance. However, reports from Bangalore indicated that both parties would have an electoral understanding in Tamil Nadu for the 2009 Lok Sabha elections.